Syncplicity is a cross-platform cloud sync and storage service that has some unique integration features. • Good documentation and support. • Unique features like Google Docs integration. • Does not encrypt files before transmission. • No dedicated mobile applications. • Mac client missing bandwidth throttling. Syncplicity sits in a market that is quickly becoming saturated as companies like Dropbox and SugarSync are becoming large players. Syncplicity however has some tricks up it sleeve to distinguish itself from the competetion. Let's dive right into the features to see what we've got in store. Syncplicity has two account types: Personal and Business. Personal ssers start out with 2 GB free, and can upgrade to 50 GB for $15 a month. Business plans are $45 a month, and have a number of customizable options including storage, and the amount of users that can login. Syncplicity's account concept is a little strange in that they also limit the amount of computers that can be synced into the system, and limit personal users to 50 GB. They have a good chart comparing three plan options on their website. 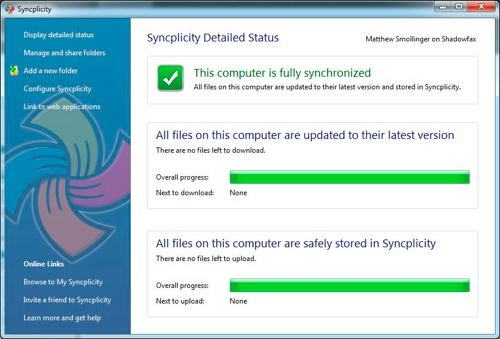 Syncplicity has more in common with SugarSync than Dropbox with regard to its sync features. It can synchronize any folder on your computer, providing a quasi-backup experience, except without the concept of backup "sets". It does offer file revisions though, and all files (including deleted ones) are kept for 30 days for Personal users. Business users have file revisions kept for the life of their account with Syncplicity. One of the distinguishing features is Google Docs integration. Syncplicity will download and synchronize your entire Google Docs account. And if you're a Premier Google Docs customer, any file you synchronize will wind up in Google Docs. All files currently in Google Docs will get exported in Microsoft Office formats, with options for the newer DOCX/PPTX/etc. or the classic DOC/PPT/etc. file types. Also included is the ability to edit your documents using Zoho, which is a competing cloud office suite. It requires a Zoho account, which I didn't bother setting up for this review. Zoho is in the pipeline for reviews so we'll give it a full treatment then. Installation differs depending on if you're installing to Windows or Mac OS. Windows users will be guided through a setup tour with a wizard. Mac users are treated with a slightly more Dropbox-esque interface. Syncplicity integrates into the Finder. So Mac users will just right-click on whatever folder they want to sync, and add it through the dropdown menu. Both platforms will eventually ask if you want to sync in your home directory, i.e. Desktop, Documents, Music, etc. You can merge these folders together with other computers, but there's no option to keep them separate. I can see the benefit of merging them together, but Syncplicity should offer a way to keep them separate as well. I chose to synchronize my documents folder on my Windows computer, and on my Mac, made a copy of my desktop folder so as not to merge in with the existing folder in Syncplicity. I started on Windows first, and it began synchronizing quickly. I noticed it capping at 6 Mbps, so I went poking around and, sure enough, there's a bandwidth limiter on by default. You can't disable the bandwidth limiter, but there is a custom setting. So I set the client to fully use my 25/25 Fios connection, and it subsequently did. This places Syncplicity in the rare category with Dropbox and SugarSync of very fast cloud storage companies. The Mac client, oddly enough, does not have a bandwidth limiting option at all, which is unfortunate. Windows Clients get a wizard interface. You can choose defaults to by synced or pick your own. Here you can pick your folders to sync. A view of the small popup status window. Full status gives you a bit more information. Bandwidth can be controlled from here. There's also an advanced option to tweak the limiter more. The document integration is nice additions. The the mac client is heavily dependent on finder integration for syncing new files. The dropdown menu is similar to how Dropbox handles itself. Google Docs integration works very well. The file browser works very well, but is entirely flash-based on Desktop computers. Syncplicity does not by default synchronize in any folders your other computer has sync'd, except for the existing home folders. Anytime a new folder is synced in, Syncplicity will prompt on any other machine if it wants to sync this folder, and where to put it. I like this "opt-in" style approach, although it only happens once. Once you've synchronized that folder, any subsequent changes are synced down automatically. I hooked into my Google Docs account, which required authorizing Syncplicity with Google. Once this happened, Syncplicity began exporting all my documents onto my computer's hard drive, which was much faster than I expected after dealing with Backupify. Any changes made to these files were sync'd back into Google Docs, and all seemed to work quite well. I'm not a Google Docs Premier customer, so any files I put in there that weren't Office documents were synced into Syncplicity but not into Google Docs. File access happens mainly through your local computer. The web interface is available and lets you download or upload files, and share files and folders. The web interface is mobile-optimized, but you can't download or upload files when viewed through a mobile client. Sharing happens primarily via the web with email notifications to inform users of new shares. Fellow Syncplicity users can pull in your shares, Dropbox-style, and edit files within the share. Unlike Dropbox, you can deem certain users as "Readers" so their changes aren't synced back to you, or "Collaborators", which have their changes synced to everyone on the share. This is something we've asked for a few times along with other Dropbox users, but there has been no movement from Dropbox on it. Support is decent, with a good FAQ, and User Manual. Personal Edition purchasers receive email support with a turnaround of 1-2 days. Business users receive priority support, and can purchase additional support for access to a telephone number to call between 7AM-6PM(PST), Monday through Friday. Security is decent, with SSL connected tunnels moving files onto Syncplicity's servers where they are encrypted with AES-256. Syncplicity generates random keys for each account to do the encryption, and these keys are then copied to a different facility for added redundancy. I would prefer to see Syncplicity encrypt files on the machines before transmitting files, but this is a fairly uncommon practice in cloud storage. Syncplicity, unlike Dropbox, is open in their TOS that your files could be read by someone at Syncplicity, although not easily and most employees would not have access. It's somewhat understandable given the current US Regulations on data handling and encryption, but makes for an insecure environment. If you want more security, I'd recommend looking at Spideroak or the even more secure Wuala. In closing, Syncplicity operates as expected, and quite speedily at that. However, it is expensive, especially given that Personal edition users are limited to 5 synced computers. The addition of the Google Docs integration might be worth it for some. But for the price, I'd probably look at SugarSync or even Dropbox.